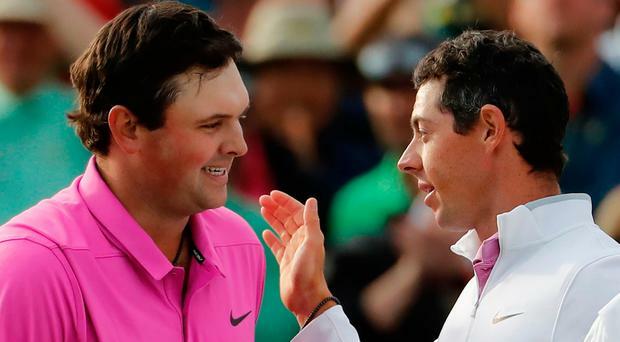 Patrick Reed, left, is congratulated by Rory McIlroy after winning the Masters. Patrick Reed held his nerve to win his first major title at the Masters while Rory McIlroy endured a frustrating final round. McIlroy ended up five shots behind the winner, carding a two over par final round 74 to finish tied fifth and delay his hopes of a career Grand Slam for another year. Victor Reed shot a one under par 71, enough for a single shot victory over Rickie Fowler, who carded a final round 67. Reed's victory means all four major titles are in the hands of Americans between the ages of 24 and 27. "I knew it was going to be tough," he said. "To close out your first major and at a place so close to me, where I went to college, it's the flows of golf. You need to know how to handle it and the way I knew how to get that down was to make sure the putter was working. "Making that putt on 14 and the two-putt on 17 gave me the confidence going onto 18. "The par putt on 18, I was happy I had hit that putt before and knew it was left-centre. "To watch the ball go in the hole and know I had won my first major - it was my goal to get back in the winners circle. To finish off the drought in the first major of the season meant so much to me." Reed's round highlights included two raking birdie putts at the third and 12th holes. There were further birdies at the seventh and 14th in a round that also included three bogeys. But it was the American's steady finish, not dropping a single shot from the 12th onwards, that got him deservedly over the line. Fowler went under the radar for much of the final round but got home with a five under par 67 to steal the clubhouse lead from Jordan Spieth. That was helped by four birdies in his last seven holes, including a thrilling three up the last hole to keep his chances of a first major title alive until Reed's final shot. Spieth threatened to write one of the all-time great Masters stories as he hit nine under par for the round through 16 holes. The course record sits at a nine under 63 and with Spieth in form, a birdie in one of the final two holes seemed plausible. But a missed birdie putt on 17 was followed by a horror tee-shot on the last and par putt miss on the final green. That got him into the clubhouse on 13 under, the dream of coming from nine shots behind at start of play to win hanging by a thread, eventually to be totally ended by Fowler stealing the clubhouse lead at -14. The Irish Open champion's steady three under par final round rarely looked likely to trouble the steady Reed, in the end finishing four shots shy. He did manage five birdies during his final round but bogeys at the fourth and 15th were enough to sufficiently halt his progress and limit the Spaniard to a credible fourth placed finish. Rory McIlroy's day began promisingly as he birdied the second to get within one of his playing partner. But that promise proved short-lived, with frustrating birdies at three and five stuttering any momentum before any hope began to fritter away around the turn. Bogeys at eight, 11 and 14 dropped McIlroy back to -9, where he would finish, his hopes of a career Grand Slam over for another season.